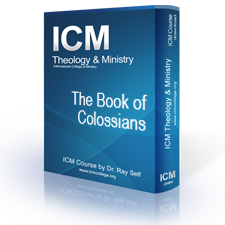 This six-lesson video course was recorded during an ICM Live Web-Class and is an in-depth six-week study of the word of God that looks carefully at this important book of the Gospel focusing on several things. First, what is the actual message of this letter? Then how is this letter to be applied to our lives. Second and most importantly we will hear how the Holy Spirit speaks to us personally though this letter. This is not another intellectual study of the bible, but instead asks the Holy Spirit to give us his revelation of the word. Colossians focuses on Jesus as the Head of the Church and the Church living in submission to that Head. Paul’s purpose in writing this letter is to show that Christ is supreme and that the Christian’s life should manifest his union with the One who is above all things. into your student account to access this course.